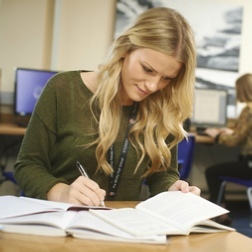 In English Language and Literature A Level, students engage creatively and independently with a variety of spoken, written and multi-modal texts. Designed with a focus on the integration of language and literature, these specifications enable students to see how linguistic and literary methods are related and to explore these links in their work. Offering clear skills progression from GCSE, these courses allow students to build on the skills and knowledge already gained and prepare for their next steps. The variety of assessment styles used, such as re-creative writing, commentary writing, discursive essays and research-based investigative writing, allows students to develop a wide range of skills. These include the ability to read critically, analyse, evaluate and undertake independent research, which are invaluable for both further study and future employment. The specification offers a range of engaging texts with options to suit all preferences, so you can choose the texts that will be most appealing and of most interest to our students. The A-level non-exam assessment component reinforces the integrated nature of the specification whilst also providing opportunities for students to pursue their own areas of interest and develop personal and independent learning skills.